Cheaper than airline excess baggage fees, as found by consumer watchdog Which? Take what you want, not just what you can with our generous weight allowances. Don't just jump the queues, skip them altogether when you use Send My Bag. No need to wait at the luggage carousel, we deliver straight to your doorstep. Our door to door courier service allows you to travel light, like the VIP you are. Review United Airlines baggage allowance and baggage fees before travelling. If you need to take more on your journey than United's baggage allowance permits, or if you would rather do without the hassle of travelling with luggage, why not ship your luggage using our door-to-door luggage service? We pick your luggage up before you leave, then deliver it to your destination, whether that's your new home abroad or a hotel reception. Read more about sending unaccompanied baggage. The United Airlines carry-on allowance permits you to bring one cabin bag at 9 x 14 x 22 inches (22 x 35 x 56 cm), plus one personal item with maximum total dimensions of 9 x 10 x 17 inches (22 x 25 x 43 cm). The United Airlines baggage allowance for passengers travelling on a Basic Economy fare is different, however. Basic Economy passengers are not permitted to carry on board a larger cabin bag. Basic Economy Fare passengers may only bring on board one personal item with maximum dimensions of 9 x 10 x 17 inches (22 x 25 x 43 cm). If you are a Basic Economy passenger and bring a full-sized cabin bag to the gate, you will be required to check it in and pay a $25 handling fee. Items such as an umbrella, child restraint or nappy/diaper bag are also permitted by the United Airlines baggage allowance. On United Express flights, customers may need to check in larger cabin items at the gate, due to the smaller aircraft being used on these routes. Adults travelling with infants on their lap may bring a diaper bag, breast pump and child seat, in addition to their standard carry-on allowance. The United Airlines baggage allowance rules state that musical instruments may be carried on board, along with a personal item, and stowed in the overhead locker or under the seat in front. If travelling on a Basic Economy fare, however, the instrument can be carried instead of a personal item. If you bring an instrument to the gate that cannot be stored in the cabin, it must be checked and a $25 handling fee must be paid. As part of United Airlines' carry on allowance, domesticated cats, dogs, rabbits and birds (except cockatoos) are permitted to travel in the cabin on most flights within the US. A pet must be transported in a carrier and can be carried in addition to a carry-on bag. The cost is $125, one way. The maximum dimensions for hard-sided kennels are 17.5 x 12 x 7.5 inches (44 x 30 x 19 cm). The maximum dimensions for soft-sided kennels are 18 x 11 x 11 inches (46 x 28 x 28 cm). With the exception of birds, there may only be one pet per kennel, and the animal must be able to stand up and turn around comfortably. United Airlines' checked baggage allowance permits Economy and Basic Economy fare passengers to check into the hold bags that measure no more than 62 inches (158 cm) in total and that weigh no more than 50 lbs (23 kg). Higher fares, such as Business and First, plus active US military personnel, may carry bags up to 70 lbs (32 kg) in weight. US military personnel on orders are allowed to check luggage measuring up to 115 inches (292 cm) in total. The amount United charges for checked baggage varies according to route. $30 for the first checked bag and $40 for the second. On an economy fare to Europe, the first bag is free of charge and the second costs $100. A number of routes, such as US - Dubai / Rio de Janeiro, permit 2 checked bags free of charge. There are increased United luggage allowances with higher fare types. Children, including infants on a fare that is 10% of an adult fare, are granted the standard United checked baggage allowance, plus an allowance of one pushchair or car seat. 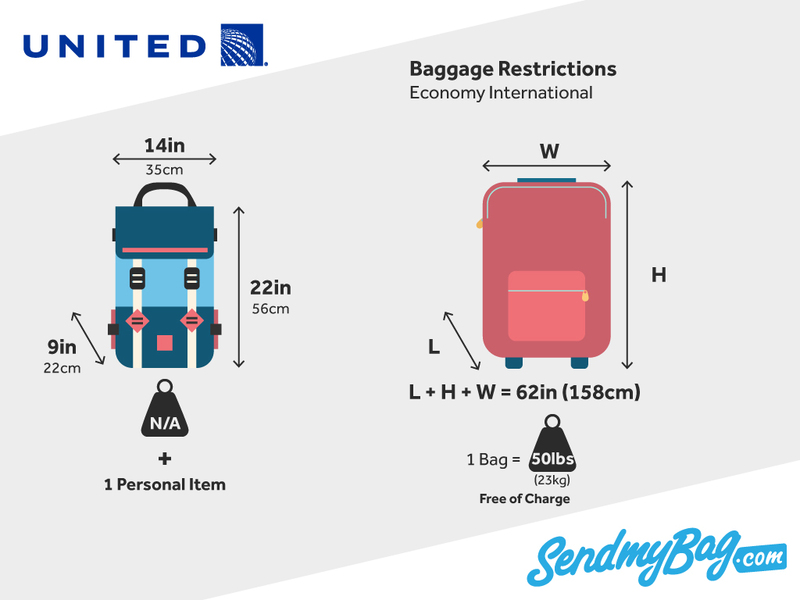 If a bag exceeds the United Airlines baggage allowance, fees will be charged. These vary according to destination and the type of fare travelled on. For example, on an economy fare between Europe and the US, a third, and any further bag, costs $200. On an economy fare from Newark to Chicago, a third, and any additional bag, costs $150. According to the rules regarding United’s baggage allowances, all three penalties could potentially apply to one bag. On flights between the US and Brazil, Puerto Rico and the US Virgin Islands, only three extra bags can be checked. Please note that there are both temporary and permanent excess baggage embargos on certain routes, which restrict baggage allowances with United. Items that the United Airlines baggage allowance rules consider to be exceptional items, such as sports equipment, can be checked into the hold, often as standard checked baggage. There are some exceptions, however. For example, bicycles over 50 lbs (23 kg) and/or 62 inches (158 cm) incur a $150 service charge for travel between the US, Canada, Puerto Rico and the US Virgin Islands, and a $200 service charge for all other routes. Musical instruments can be checked into the hold, provided they are properly packaged. Oversize charges apply to musical instruments that measure 63 to115 inches in total dimensions. Overweight charges apply to musical instruments that are over 50 lbs, but those weighing up to 165 lbs will be accepted. If the instrument is over 115 inches in total dimensions, you should contact the United Customer Contact Center. Pets can be transported in the hold. Costs for this vary greatly. For example, for travel from the US to the UK, it costs $684 to transport an animal weighing between 5 and 24 kg. Looking for United sized hand luggage? It can be difficult to know if your cabin baggage meets an airline's size requirements, for your convenience here is a selection of luggage which retailers state are approved by the airlines. We recommend checking with the retailer that the bag is suitable for your airline and other requirements.